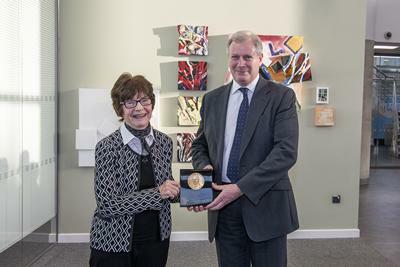 Professor Freda Stevenson receives the Henry M Stratton Medal from Professor Peter Johnson. 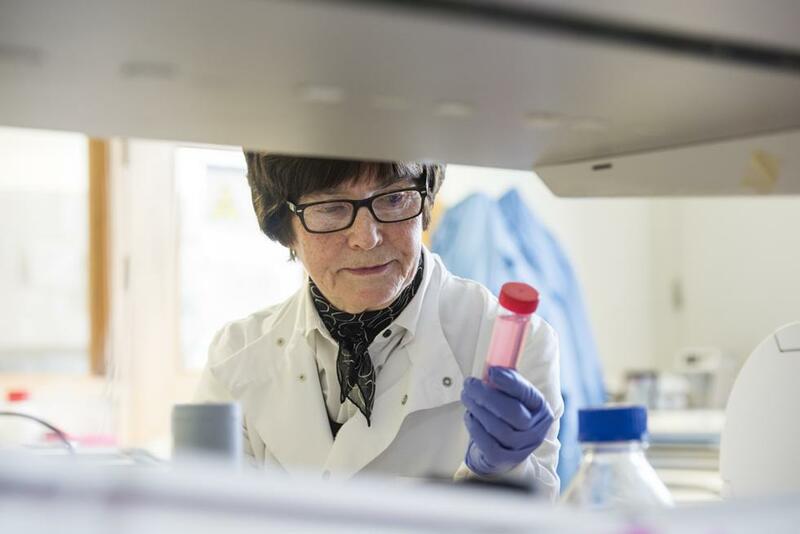 World-leading immunologist, Professor Freda Stevenson from the University of Southampton and University Hospital Southampton NHS Foundation Trust, has become the first British recipient of the prestigious Henry M. Stratton Medal for her highly influential contribution to haematology research. The Medal, awarded by The American Society of Haematology (ASH), recognises Professor Stevenson’s role at the forefront of cancer immunology research for over 40 years, where she has led, shaped and continues to pioneer ground-breaking research in understanding how to engage the immune system in the fight against lymphoma, for which Southampton is now widely recognised. Professor Stevenson is highly regarded for her pioneering work in the biology of B-cell malignancies, such as lymphoma and chronic lymphocytic leukaemia (CLL). She is credited with numerous contributions to the field, including the discovery that CLL consists of two significantly different subsets, one of which is associated with more rapid disease progression. This knowledge currently serves as a major indicator of prognosis and has also offered targets for drug therapies that are now demonstrating clinical efficacy. The publication of this work has been cited 1,886 times and earned Professor Stevenson the Rai-Binet Medal from the International Workshop on Chronic Lymphocytic Leukaemia. In addition, she was the first to propose and test an anti-CD38 monoclonal antibody treatment for patients with multiple myeloma, the results of which were published in Blood and formed the preliminary basis for the development of the drug that is today known as daratumumab. Her other notable contributions include the discovery of a lymphoma-specific sugar target or “Achilles heel” of follicular lymphoma on B-cell receptors, which may be a target for future therapy. Professor Stevenson also designed gene-based vaccines that work against tumour antigens to help provide long-term protection against cancer relapse. While initially used to treat lymphoma, this strategy is now being tested in solid tumours. For this work, Professor Stevenson was awarded the European Haematology Association’s Jean Bernard Lifetime Achievement Award. The Henry M Stratton Medal is named after the late Henry Maurice Stratton, co-founder of Grune and Stratton, the medical publishing house that first published ASH’s journal Blood. Read our Q&A with Professor Stevenson. 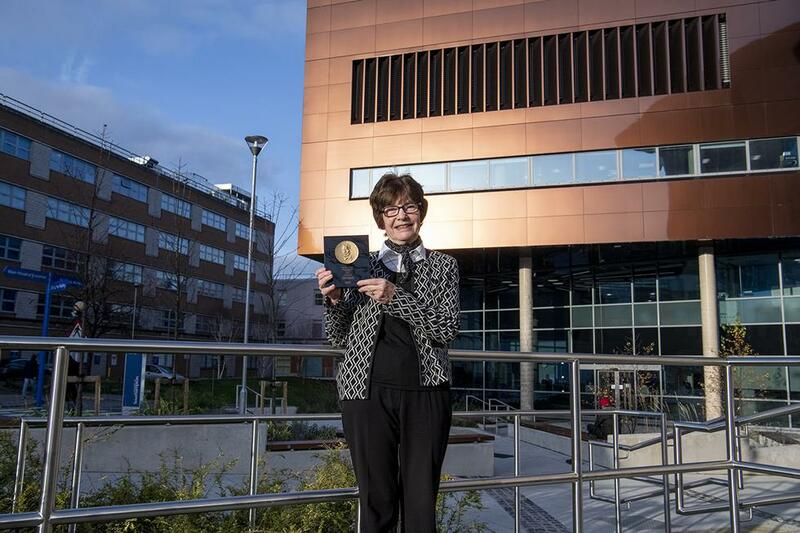 Professor Stevenson has been awarded the Henry M Stratton Medal in recognition of her pioneering work in the biology of B-cell malignancies, such as lymphoma and chronic lymphocytic leukaemia (CLL). World-leading immunologist, Professor Freda Stevenson, is the first British recipient of the prestigious Henry M. Stratton Medal for her highly influential contribution to haematology research.